Bliss liquid-tight flexible conduit S2067 is compliant to the RoHS Directive of Europe Union. SGS had proved our care-free materials. Good performance enlarges your living safety. 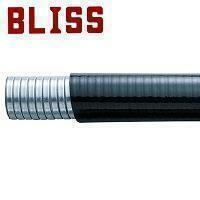 Bliss Flexible conduit - High quality, good efficiency and best service is your first choice! Applying BLISS flexible conduit on all constructions or machinery for better cable management and safer working & living environment! Liquid-tight, oil-resistant, flame retardant, and sunlight resistant. Temperature range: -55°C ~ 105°C . With movement & vibration absorbing ability, high tensile, best performance on automatic machinery, sophisticated facility installation.